This page is dedicated to showing Greenview Designs, and their well received stories in the popular home improvement media outlets. Smiles all around. Busch’s passion for the outdoors drew him to landscape design and architecture. A resident of Hopewell, he enjoys seeing his designs come to life as well as the excitement on his clients’ faces, whether they’re lighting up their new fire pit or trying out their new grill. “I love building exquisite outdoor living spaces for our clients and their families to enjoy for generations,” he says. An early start. Busch founded Greenview Designs a year before graduating from Princeton High School in 1988. “I had 25 guys working for me by the time I was 18 years old,” he says. He believes a well-thought-out design by a landscape architect is the key to a successful outdoor space. “Things need to be planned and laid out strategically so the backyard fits the client’s needs,” he says. Read Busch’s tips below to enjoy an outdoor haven at home. 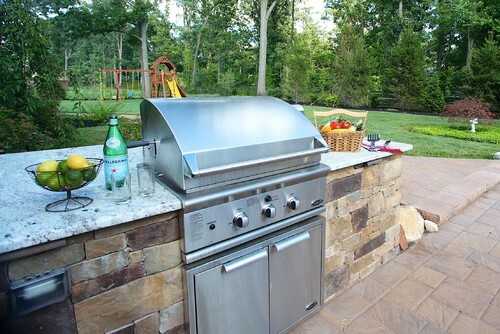 Build an outdoor kitchen that caters to your family’s favorite foods. Install a side burner, for example, if you like cooking clams and marinara, Busch says. You may also want to add a refrigerator, an ice maker, a pizza oven or a pergola. He recommends choosing granite counter tops, as they stand up to citrus, condiments and grease. A young couple in Somerset requested a “fully loaded” backyard paradise with a cooking station, seen here. Built close to the house for easy accessibility, it features separate counters for raw and cooked food. “The clients are planning to raise their kids out here; this is where they’re going to have birthday parties and family gatherings,” Busch says. Designing your own backyard offers a chance to treat your family to luxurious extras. Busch suggests installing a fireplace or fire bowl filled with glass or lava rock; it can cast a lovely glow. Some fire bowls also include a water feature for an added wow factor. 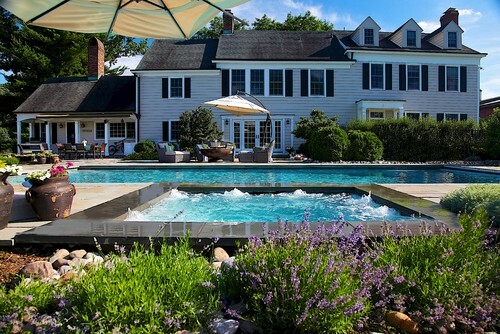 The same house in Somerset features a resort-style swim-up bar and pergola, a raised spa and an expansive sun shelf. “The sun shelf has an umbrella sleeve so the family can drop in an umbrella whenever they want,” Busch says. “They can also use the spa year-round, as it has a summer-winter hookup.” The Greenview Designs team built a custom waterfall using bluestone and boulders as well. The right outdoor lighting can transform your backyard, illuminating its beauty and that of your house. Also use it to highlight garden sculptures, benches and walkways. Busch recommends using long-lasting LED lights and durable bronze fixtures, and having them installed by a licensed electrician. 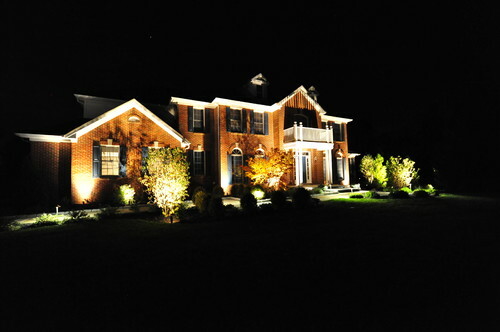 The team installed an array of low-voltage lighting to illuminate the Pennington home seen here. The lights deter intruders and make entering the home safe for guests. “A well-lit house is a safe house,” Busch says. The team also installed porcelain tile so no one would slip or get burned feet while enjoying the yard.